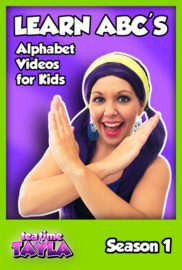 This ABC Series from Tea Time with Tayla includes fun educational phonics videos for children. Learn each letter of the English Alphabet, Sing the ABC Song, ride the Alphabet Train, and more! Hey Parents! This ABC Series from "Tea Time with Tayla" includes fun educational phonics videos for your children. Learn each letter of the English Alphabet, Sing the ABC Song, and ride the Alphabet Train! Join Tayla in this comprehensive and interactive collection of ABC episodes for kids! If you want to give your kids a head start on their education, then let them watch and learn their ABC's with "Tea Time with Tayla's, "Learn ABC's, Alphabet Video for Kids"
- Bonus Episode: The ABC Train! Does Your Child Love to Sing Nursery Rhymes? Then they'll love Tea Time with Tayla! Parents of Babies and Toddlers use Tea Time with Tayla's educational Videos to Teach Basic English Vocabulary and Concepts. Tea Time with Tayla not only has fun kids songs and children's music videos, but also has Children's Edutainment Videos that teach Counting, Colors, The Alphabet, ABC's, Shapes and More.